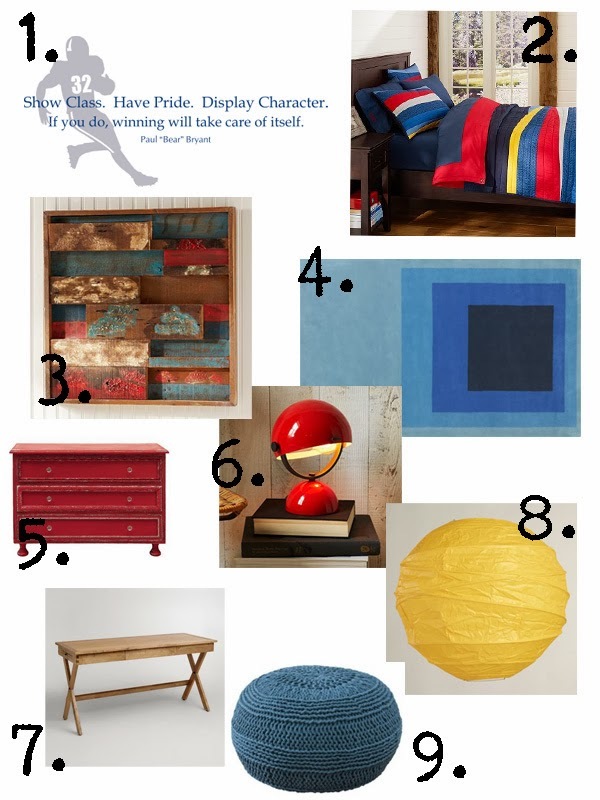 Decorating a teenage boy's room can be challenging at best, so today's mood board is here to help by creating a masculine and fun space that will take him well into early adulthood. We've combined a simple color palette, both wood and painted furniture, and a mix of textures to bring a room both you and your teen will love! 1. This Wall Quotes™ decal is the perfect way to build character and sportsmanship in your athlete; it's simple and uncluttered aesthetic fits seamlessly into this space! 2. This bedding set from PB Teen was the starting off point for this room. With it's abstract swashes of bold color, it's a modern and impactful focal point. 3. Made of recycled wood, this Color Block Planked Art is a rustic way to add some color and style to his walls. 4. Making a bold and graphic statement, this Blue Block Rug is one of my favorite parts of this space. 5. Worried about your teenager not being able to care for his furniture? Don't be. With this distressed red dresser, a few more dings and imperfections will only add to it's character! 6. Adding some mid-century style to the space, this Mini Task Lamp from West Elm is both functional and stylish! 7. Just like your teenager, the Campaign Desk from World Market is rugged yet handsome...the perfect piece for this masculine space! 8. What's more fun than paper lanterns? Not much. Add some casual lighting to the space with these yellow paper lanterns that you are both sure to love. 9. Add extra seating with this durable cotton pouf....the classic shape and nubby texture is a style bonus! All these picks are awesome, perfect stuff for cozy home.